Scooters and bikes have become very common vehicles around the world. As the traffic on the roads is going on increasing day by day, people are opting two wheeler more than four wheeler. There are certain scooters for boys and some for girls. As mentioned in the article below, Hero motocorp maestro has been designed for male and Scooty Pep has been designed for female. However, Maestro has been targeted under the uni-sexual as well ! That means, it can be ridden by both male and female. These two bikes are giving a very tough competition to the other popular brands such as Honda, Mahindra, Suzuki etc, in terms of mileage, engine power, design and other specifications. Hero Motocorp Maestro, a 110 cc bike has been newly designed from Hero Manufacturer. It has got a great stunning looks compared to previous model which was launched in 2012. Hero Maestro gives a very touch competition to Honda Activa in terms of looks, mileage and engine power. 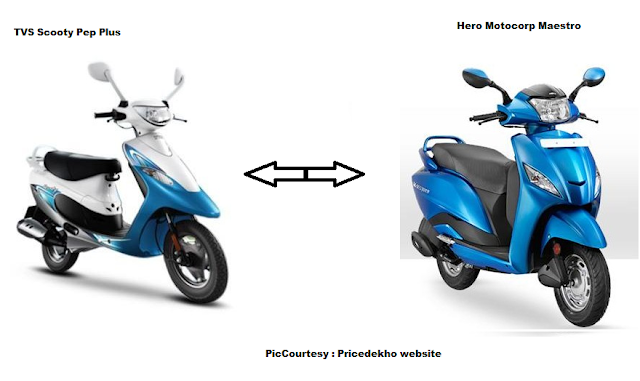 If we compare Hero Maestro and Honda Activa, the maximum power is slightly greater but coming to milaege, Hero Maestro got beaten up by 5 liters !! As noted, Maestro gives an average milaege of 45 kmpl in cities and around 55 kmpl on highways. Below are some basic features of Hero Motocorp Maestro. It uses a 4-stroke single cylinder, 109 cc. It has a maximum power of 8.2 Bhp @ 7500 rpm. Electric start and kick start are the two options to start the engine. The wheels of Maestro consists of tubeless tires that are made up of Alloy. It can go on the top speed of 90 kmph. It has larger storage space and comfortable wide seating arrangement. Talking about the Mileage, it gives up-to 40-45 kmpl. The fuel tank capacity is of 5.30 liters. Currently, there are only 6 colors available in the market to choose from. The weight of Maestro is 110 Kgs. TVS Scooty Pep is one of the most popular and most selling ladies bike in India. Scooty pep is a below 100cc ladies bike which gives mileage of 40-45 kmpl on an average. It has a best option of self start and the automatic gears with an easy center stand. Scooty Pep comes with a digital speedometer and compared to previous version, the manufacturer has launched pep plus with great attractive new looks and advanced technology. Below, you can see the basic features of TVS Scooty Pep Plus. It uses a 4-stroke single cylinder Forced Air-cooled, 87.8 cc. It has a maximum power of 4.93 Bhp @ 6500 rpm. The wheels of Scooty Pep consists of tubeless tires that are made up of Alloy. It can go on the top speed of 75 kmph. The fuel tank capacity is of 5.00 liters. Currently, there are only 5 colors available in the market to choose from. The weight of Scooty pep is 95 Kgs.